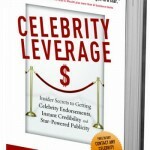 Minneapolis – January 19, 2010 – Publicity coach Dan Janal was quoted extensively in “Celebrity Leverage” a new book published today by Jordan McAuley . This is the 69th book that has featured Dan Janal, who is widely regarded as one of the most highly regarded thought leaders in publicity and the Internet. The citations range from testimonials, short quotes, lengthy interviews, screen shots of his websites, as well as acknowledgements and thank you’s. Janal continues to help authors and thought leaders get publicity by combining coaching, consulting and mentoring into a uniquely helpful one-on-one consultation program. Dan’s coaching helps people get an outside perspective from an acknowledged expert in the industry. He has helped clients outline chapters for books, think of story angles that reporters will write about, and get clear on their marketing goals. Janal also operates the PRLEADS.com service that helps authors and small businesses get quoted in top daily newspapers, magazines and leading online websites. Based in suburban Minneapolis, Dan understands publicity as only a former newspaper reporter can. As an award-winning daily newspaper reporter and business news editor, he interviewed President Gerald Ford and First Lady Barbara Bush. Dan Janal is one of the most respected teachers, visionaries and entrepreneurs in the publicity community. He has written six books about Internet Marketing for John Wiley & Sons, and has been an in-demand, international speaker for nearly 20 years. Dan was on the PR team that launched AOL and wrote one of the first books about Internet Marketing in 1994. He taught the first Internet Marketing class at Berkeley and also taught Internet Branding classes at Stanford. Corporate clients include IBM, The Reader’s Digest and American Express. He has spoken at conferences for the National Football League, Credit Union Executive Society and many others. He has created innovative ways for people to get publicity, including the Cool Book of the Day site to help authors get publicity for books; and the Free Publicity Tools.com site to help entrepreneurs find resources to help promote their businesses. 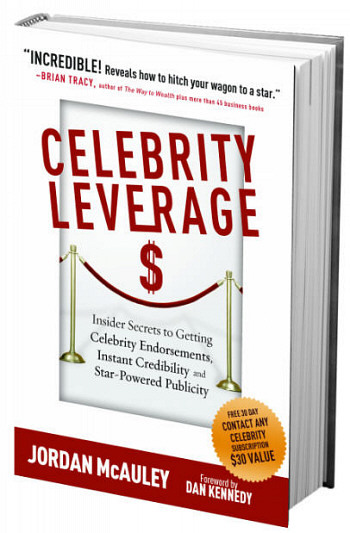 Celebrity Leverage (Jordan McAuley, Mega Niche Media; January 11, 2010; Paperback Original; $19.95) reveals how to get free and low-cost celebrity endorsements, product placement, celebrity buzz, and more. Each chapter includes Insider Interviews with today’s top marketing and publicity experts like Joe Vitale of The Secret, Dan Kennedy of The No B.S. Guide to Marketing to the Affluent, Jake Halpern of Fame Junkies, Donna Cutting of The Celebrity Experience, Rick Frishman of Author 101, Yanik Silver of Maverick Business Adventures, Robyn Spizman of The Giftionary and others. Jordan McAuley’s record spans more than a decade in publicity, marketing, entrepreneurship and events. Known as the “King of Celebrity Contacts,” his Contact Any Celebrity service is one of the most respected publicity resources in the world, with a blue-chip roster of marketers, publicists, nonprofits and media clients who rely on it to get endorsements, donations, interviews, and more.